Summary: Windows PowerShell MVP, Teresa Wilson, talks about upgrading Windows PowerShell 2.0 to Windows PowerShell 4.0 in Windows 7. I know that Windows 7 has been out for a while—actually, a pretty good while, and there is no telling what all has been added, updated, or changed. So I thought I should start at the beginning. I'm back. To be honest, it was enough time for two cups of hot chocolate, two Hershey bars, a bag of popcorn, a soda, and a ham and cheese sandwich. It now says it is preparing to install. I'm not sure exactly what it is preparing—but anyway, it is still prepping. Neat. I know I am supposed to be going through these things without making any changes. But hey, I can’t help it—I right-click both the Windows PowerShell and the Windows PowerShell ISE icons and select Add Pin to Task Bar from the action menu. No matter what, Windows doesn’t look right to me without the friendly Windows PowerShell icons prominently displayed. It tells me that I installed 178 hotfixes. Wow. I am sure glad that Windows PowerShell has the Get-HotFix cmdlet to tell me these things. I decide that I want to double-check the version of Windows PowerShell. 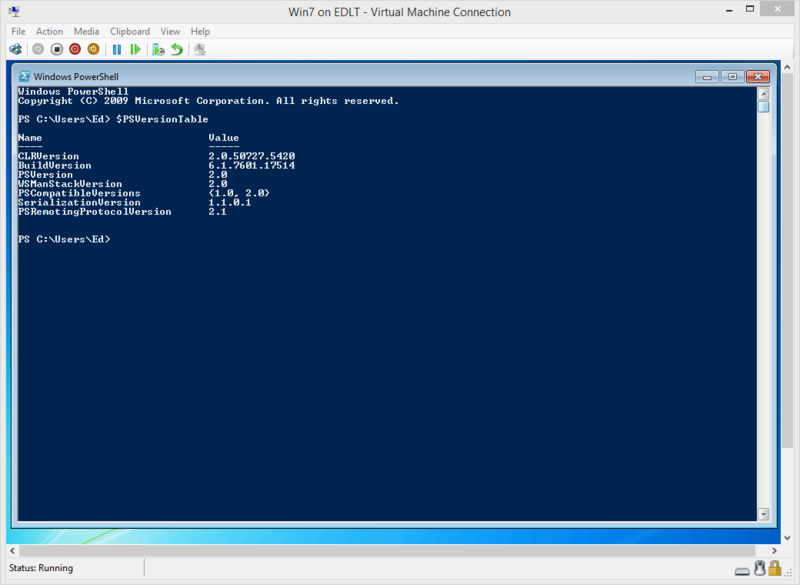 So I use the $PSVersionTable automatic variable, and it tells me the PSVersion is still Windows PowerShell 2.0. It says I have AMD64, so I guess this means that I have a 64-bit version of Windows installed. The good thing is that if I get this wrong, the installer will tell me—so it is not like I will end up hosing my computer. Plus, because I am doing this in a virtual machine, if I do hose things, I can easily shut down, and revert to my latest snapshot. The easiest way to find Windows PowerShell 4.0 is to go to the Microsoft Script Center home page, and select Windows PowerShell 4.0 from the Scripting Downloads section. After I make my selections and click Next, a dialog box appears at the bottom of the screen asking me to disable the popup blocker. I say OK, and I am prompted as to where to download the files. I choose the FSO folder, and again I am prompted for each of the items I checked. I go to my c:\fso folder, double-click the update file, and see a prompt asking me if I want to install Update for Windows (KB2819745). I say yes, but I wonder why it did not ask me if I wanted to install Windows PowerShell 4.0, or at least Windows Management Framework 4.0. Oh, well, so now there are three different names. I click OK, and I am prompted with the license terms shown in the following image. It mentions Windows Management Framework 4.0, so I feel a bit more comfortable. However, it seems to me that the buttons are reversed. Hmm…tricky. I click I Accept. Finally, the updates are being installed—updates that I know and that I really want. WooHoo! Still installing…the little green progress bar is steadily marching to the right side of the screen. I'm holding my breath. Please, please, please don’t fail. The bar just moved over a big jump…one more big jump. It is nearly there. Yes! The installation is complete! Now one more simple reboot. It is configuring Windows Updates—70 percent complete, 80, 83, 85, 90, 91 93, 95, 96, 97, 98, percent complete—and finally, the sign-in screen. That really was easy. I installed Windows 7, ran all the default updates, then downloaded the Windows Management Framework 4.0 (also known as Update for Windows (KB2819745) and Windows PowerShell 4.0), rebooted, and it worked. That was it. Easy as baking a pie. And now I have access to all the great Windows PowerShell 4.0 stuff. That is it for now. Hope you have a great weekend.